The female wasp burrows into the ground in search of a grub. She lays her eggs on a white grub. She stings the grub to temporarily paralyze it and lays a single egg on a specific location (depending on her species). The paralyzed grub recovers from the sting to be the source of food when the egg hatches. The tiny wasp's larva starts to feed by biting the grub's skin. It feeds slowly on the body fluids of the grub. The larva molts 5 times taking about 2-3 weeks to complete. Before pupating, the larva eats the remainder of its host and then spins a small, fuzzy, brown ovate-shaped cocoon. 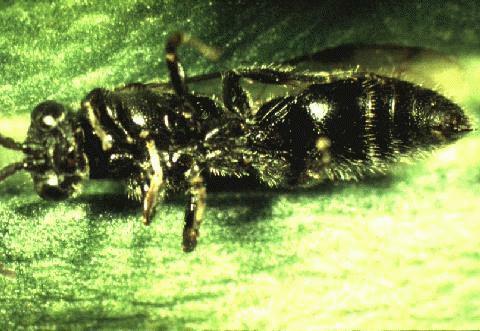 Adult Tiphia wasps are shiny dark-colored and about 1cm-2cm long wasps. They are similar to winged black ants. The female wasps' bodies are heavily set built for digging soil in search of beetle grubs. The male wasps are slender and smaller, have tiny hooks at the end of their abdomens which are used for mating. Tiphia wasps feed primarily on the honeydew emitted by aphids, scale insects, and leafhoppers but they also feed on the nectar of blossoms. Tiphia wasps are native to Japan, Korea, and North China. They are now found in cooler climates where they have been introduced to control Japanese beetles and other scarab beetles (CABI, 2000). Tiphia wasps' presence is greatly influenced by the availability of adult food sources. The female adults feed in the morning in vegetations for food, such as nectar or honeydews (emitted by aphids or whiteflies), before looking for grubs to deposit their eggs. Under favorable conditions they can parasitize up to 60% of beetle larvae in a given area. Like other insects, they are killed by pesticide, so it is not advised to use pesticides indiscriminately (Ohio State University, 2003).